Hendrik Goltzius, a brilliant printmaker, draftsman, painter, and the head of a workshop that dominated Dutch printmaking during the late 16th and early 17th centuries, is the first name most people think about when they think about the Dutch Mannerist movement. As the recent travelling exhibition at the Rijksmuseum, Amsterdam, The Metropolitan Museum of Art, New York, and The Toledo (Ohio) Museum of Art (and the massive accompanying book, Hendrick Goltzius (1558-11617): Drawings, Prints, and Paintings by Huigen Leeflang, Ger Luitjen and others, make clear, Goltzius, "favored by an emperor [Rudolph II] and other European sovereigns" is a artist of "exceptional versatility, quality, and importance" (p. 6). As an engraver, his technique was unmatched; as a designer of prints and a draftsman, he offered the definitive version of Dutch Mannerism; and his drawing-paintings filled his contemporaries with admiration and sill overwhelm viewrs (as the exhibition proved). His designs for Ovid's Metamorphoses, engraved by members of his studio, set a pattern that dominated Dutch art into the mid-17th century (we will be adding some pages devoted to them shortly) and his engravings for the Passion recapitulate Northern printmaking from Durer and Lucas van Leyden until Goltzius' own works. All of the engravings for the Passion illustrated here come from a set of 11 of the 12 plates we purchased at auction as a set. Many of these came from the collection of John S. Philips, whose collection was willed to The Pennsylvania Academy of Fine Arts, and bear the stamps of John S. Philips and The Pennsylvania Academy of Fine Arts (with their P.A.F.A stamp verso). These were subsequently acquired by the Philadelphia Museum of Art as part of their purchase of the P.A.F.A collection and offered for sale as surplus. Ecce Homo / Behold the Man (Bartsch 34, Hirschmann 28, Strauss 341 i/ii). Original engraving, 1597. A beautiful impression on laid paper. Signed and dated in the plate. 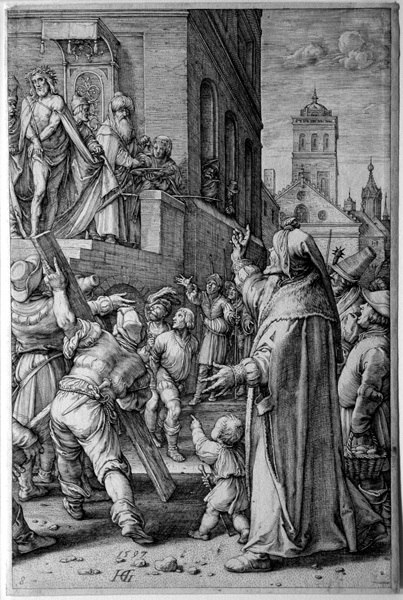 Although the work is engraved in the manner of Lucas van Leyden, Strauss observes that the composition is based upon Durer's in the Large and Small Woodcut Passions. Signed and dated in the plate, numbered bottom left margin. Small stain on the right sleeve of the standing man right foreground. Ex collection John S. Philips, The Pennsylvania Academy of Fine Arts (with their PAFA stamp verso), and the Philadelphia Museum of Art, who received it as part of their purchase of the PAFA collection and offered it for sale as surplus. Image size: 200x133mm. Price: $5500. 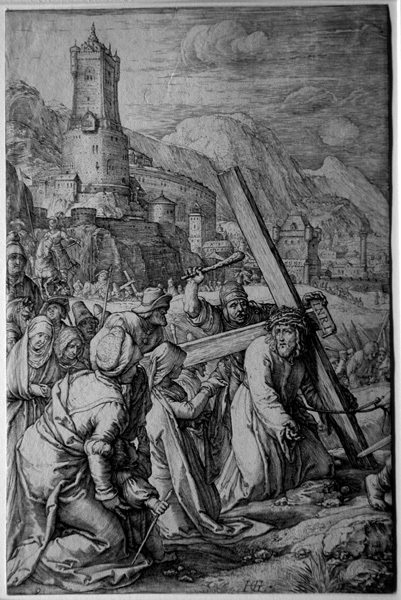 Christ bearing the Cross (Bartsch 35, Hirschmann 29, Strauss 353 i/ii). Original engraving, 1598. A very good impression on laid paper of the first state of two; trimmed on or within the platemark. Signed in the plate, numbered bottom left margin. Ex collection John S. Philips, The Pennsylvania Academy of Fine Arts (with their PAFA stamp verso), and the Philadelphia Museum of Art, who received it as part of their purchase of the PAFA collection and offered it for sale as surplus. 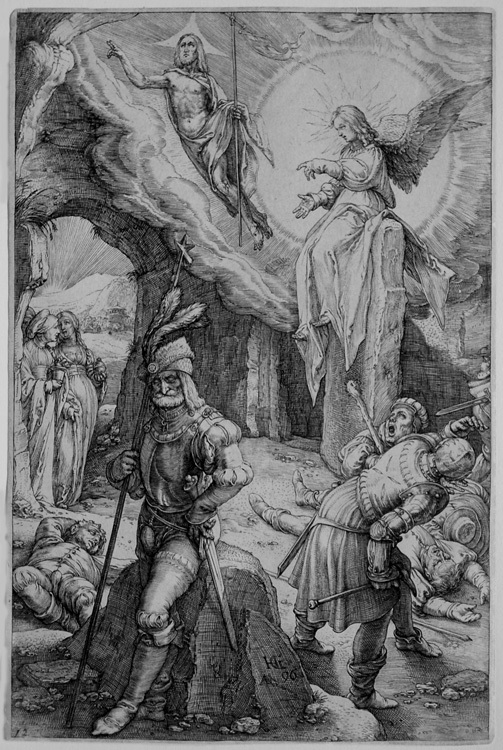 Strauss observes that Goltzius' inventiveness reaches a high point here, where in contrast to all of the other versions Goltzius knew, Christ here almost looks as if he is leading a parade, and pausing only to look at St. Veronica. Image size: 197x130mm. Price: $5500. Calvary (Bartsch 36, Hirschmann 30, Strauss 354 i/ii). Original engraving, 1598. A beautiful impression on laid paper of the first state of two. Signed, dated, and numbered 10 in the plate. Watermark: Coat of Arms with a Tower (Briquet 2291, 1592-96). Thread margins on all sides. 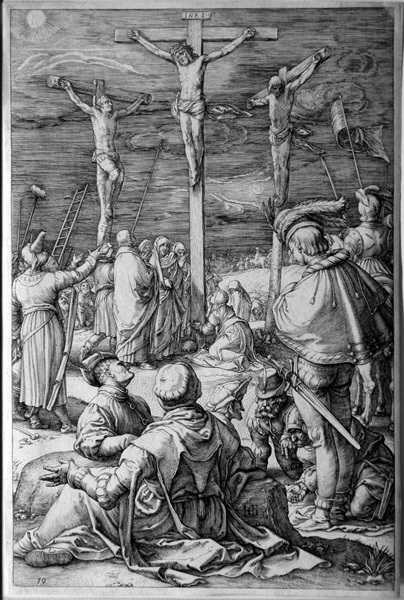 Strauss notes that the Calvary scene does not exist in either Dürer's Passions or that of Lucas van Leyden, though there is a single Durer woodcut that might have influenced Goltzius. Image size: 196x130mm. Price: $6000. 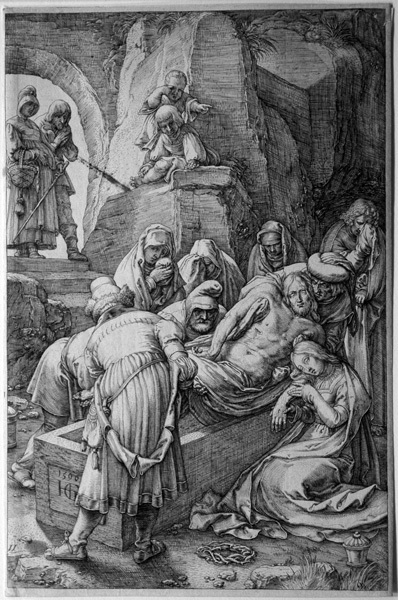 The Entombment (Bartsch 37, Hirschmann 31, Strauss 334 i/ii). Original engraving, 1596. A beautiful impression on laid paper of the first state of two. Signed, dated, and numbered 11 in the plate. Small stain lower left by the foot of the man placing Christ's legs in the tomb. Watermark: Coat of Arms with Tower (Briquet 2291-Amsterdam and Utrecht, 1592-96). Strauss sees Goltzius drawing upon both Durer and Lucas here but not following either too closely. Ex collection John S. Philips, The Pennsylvania Academy of Fine Arts (with their P.A.F.A. stamp verso), and the Philadelphia Museum of Art, who received it as part of their purchase of the PAFA collection and offered it for sale as surplus. Thread margins on all sides. Image size: 196x130mm. Price: $5500. The Resurrection (Bartsch 38, Hirschmann 32, Strauss 333 i/ii). Original engraving, 1596. A beautiful impression on laid paper of the first state of two, trimmed on or within the platemark. Signed, dated, and numbered 12 in the plate. Watermark: Coat of Basel with three rings attached (Briquet 1314, 1591). Strauss says Goltzius here departs radically from both Durer and Lucas van Leyden here by having Christ ascending diagonally in the picture plane, unobserved by bystanders (except for the two guards lower right, one of whom stares open-mouthed while the other tries to shield himslef from the explosion of light). Ex collection John S. Philips, The Pennsylvania Academy of Fine Arts (with their P.A.F.A. stamp verso), and the Philadelphia Museum of Art, who received it as part of their purchase of the PAFA collection and offered it for sale as surplus. Thread margins on all sides. Image size: 198x130mm. Price: $7500. The Resurrection (Bartsch 38, Hirschmann 32, Strauss 333 i/ii). Original engraving, 1596. A very good subtle impression on laid paper of the first state of two, trimmed on or within the platemark. Signed, dated, and numbered 12 in the plate. Watermark: Coat of Basel with three rings attached surmounted by a tower (similar to Briquet 1314, 1591). 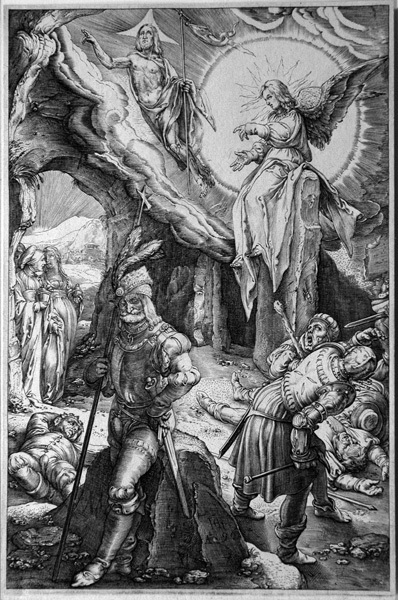 Strauss says Goltzius here departs radically from both Durer and Lucas van Leyden here by having Christ ascending diagonally in the picture plane, unobserved by bystanders (except for the two guards lower right, one of whom stares open-mouthed while the other tries to shield himslef from the explosion of light). Ex collection Philadelphia Museum of Art, with their acquisition nuber in pencil crossed out and offered it for sale as surplus. Trimmed within the platemark but outside the border on all sides. Image size: 197x132mm. Price: $6500. The Resurrection (Bartsch 38, Hirschmann 32, Strauss 333 i/ii). Engraving after Goltzius, 1596. Strauss calls this a "decptive copy, but lacking the numeral 12" lower left. A beautiful impression on laid paper. Signed HG and dated 96 in the plate. Thread margins on all sides. Image size: 195x128mm. Price: $1750.